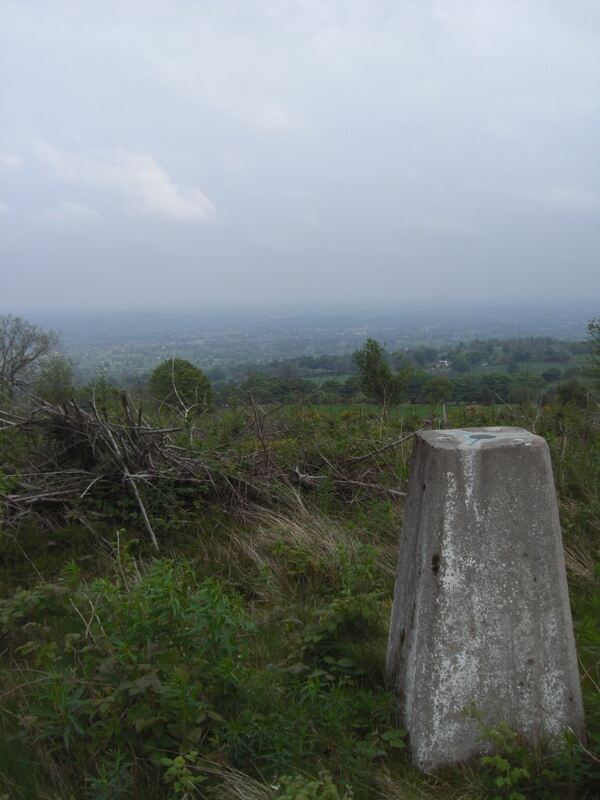 Is ranked joint 4418th with 34 other trigs (more). Completely surrounded by trees, not far from path but bushwacking all the way. 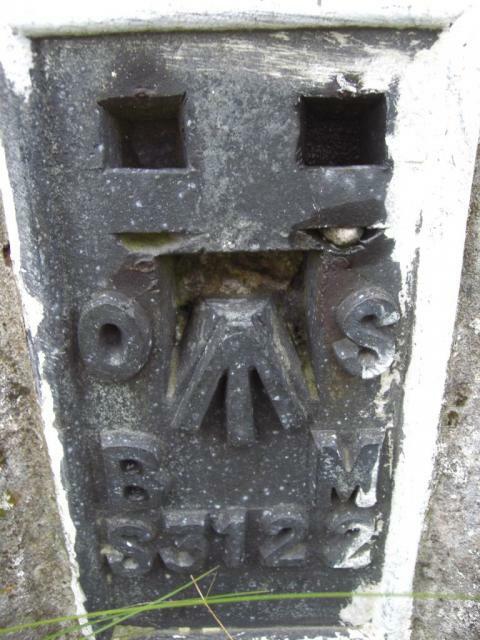 Pillar in good condition with asphalt plug and Royal Engineer crest. Footpath enters wood at SE through a kissing gate. just inside is a bench and information board. Reading/facing the board go left 33 paces, on your right should be a bit thinner/smaller trees, pillar is in there about 15m! hope this helps. From the south west, not easy. Bagged on a 14 mile walk as part of my walk 2,018 miles challenge. Well hidden in the trees and took a lot of searching to find. ODP#14: thought we'd quickly bag this before finishing our day's walk at Craignant - but how wrong we were. An absolute s*d, very difficult to find in the heather and young pine trees, no views, suspect it will be almost inaccessible in a couple of years. 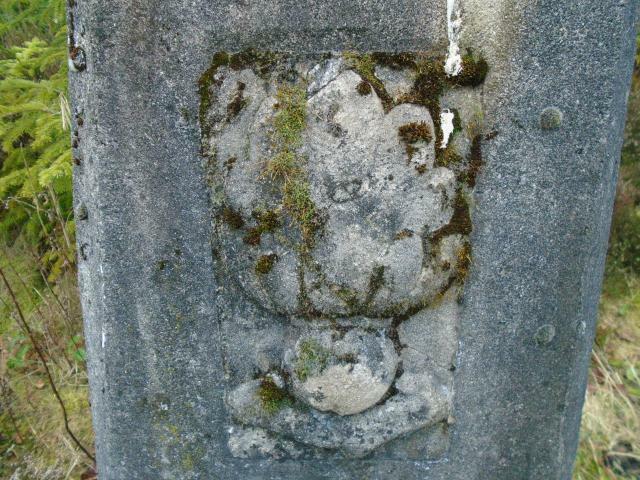 All s/holes buried, asphalt cap, interesting embossed crest on side, a bit of moss but otherwise vgc. Parked at the picnic area to the north and followed the paths round to this one. 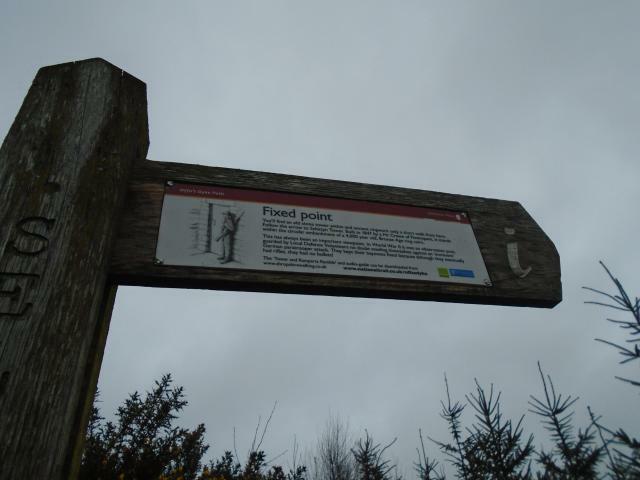 Had a laugh at the finger post directing you to Selattyn Hill. Amazing that you cannot see this pillar intil you are about 20 feet away. will only get more difficult as the trees grow. No views from pillar. 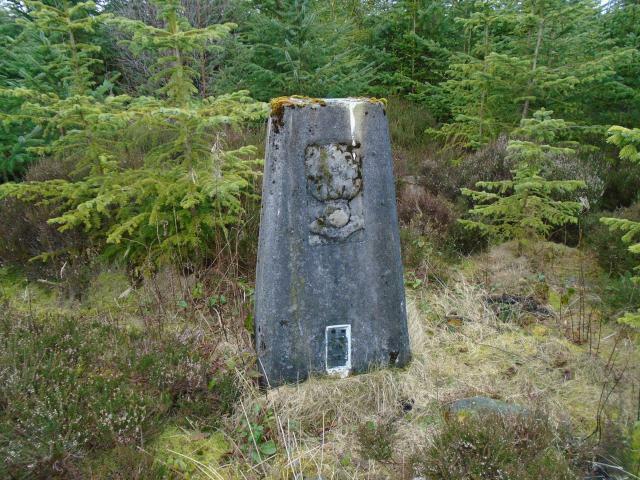 Visited with P61 on 11 Trig day out,good fun finding pillar extra interest with the tower & quirky way marker. Parked up at start of bridleway below farm easy approach at start then my gps crashed and i could not get a fix.Luckily my mate had an etrex and loaded the GR which made finding the trig less problematic as it was wall hidden and was not found until the last moment.Trig was in vgc with royal engineers crest great view here as well. Some great views from the top. Also great to meet Sniffadogz. 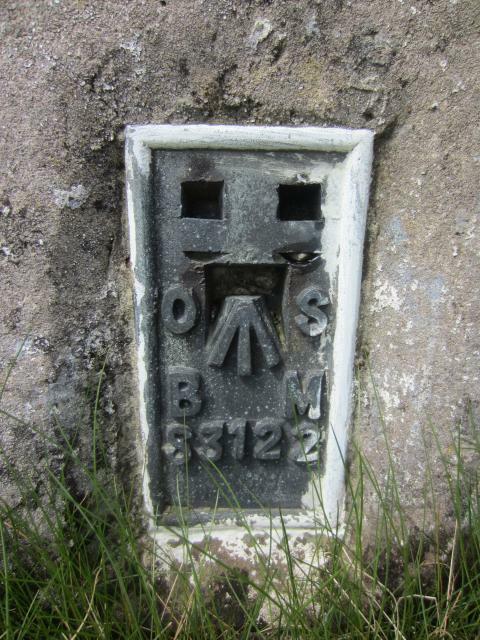 Tricky one to locate even with the GPSr! 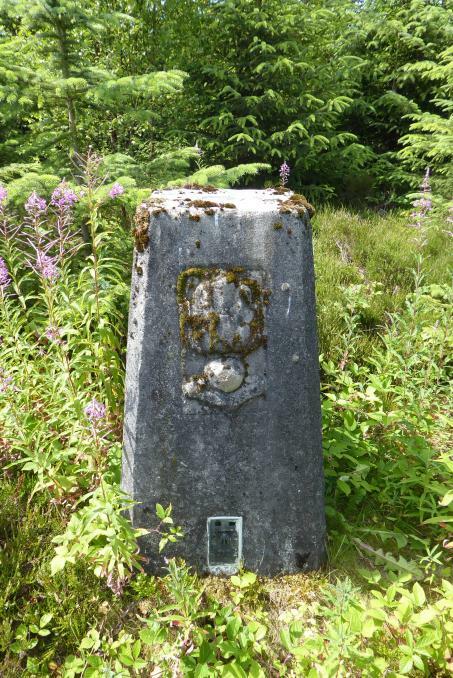 Followed well signed footpath "Selattyn Hill" from road to NE. 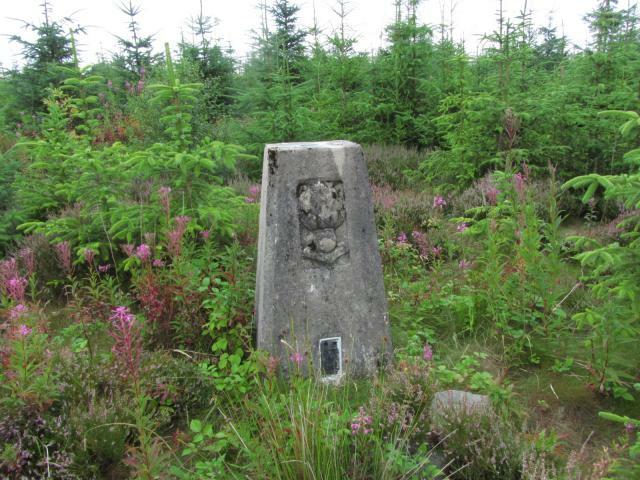 Path is a little overgrown in places but signposted and has plenty of wee 'kissing gates'. 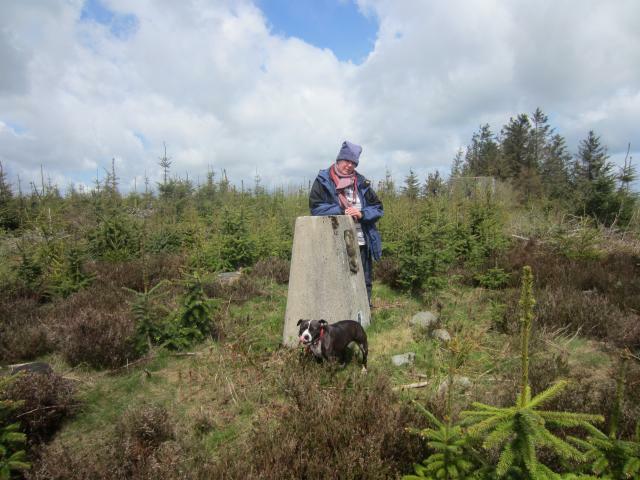 Folly easy to spot and trig a little hidden in the undergrowth but we got there in the end! 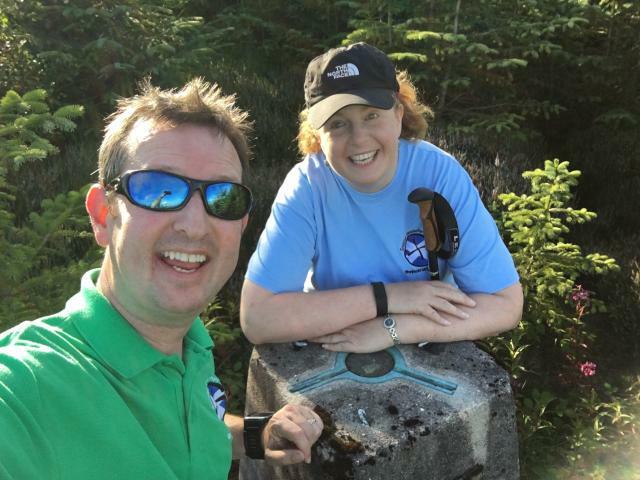 Met another cacher at the start of the walk and had a wee chat. Visited the building and then went through the undergrowth to the pillar. Not easy and hidden well. Great spot. Cheers. 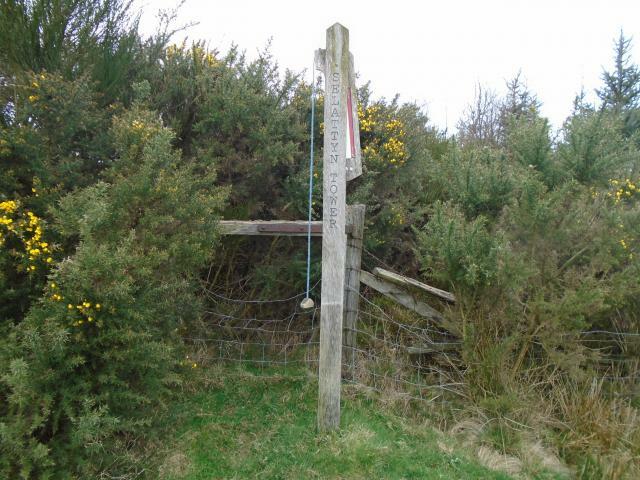 Followed well signed footpath "Selattyn Hill" from road to NE. 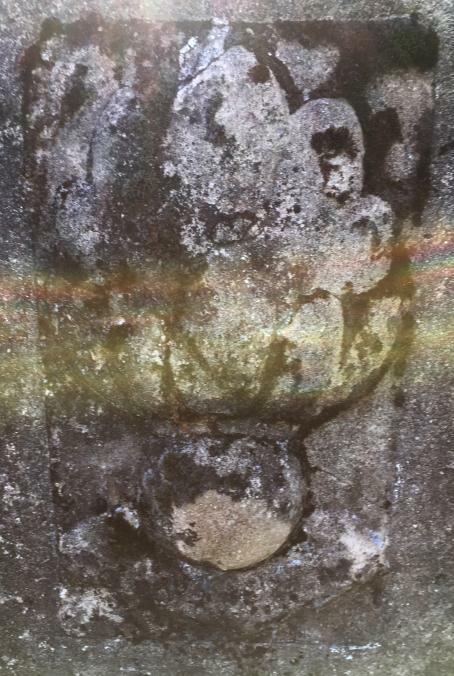 Wandered round top for a while hoping for a clue as to the site of the pillar! Headed back downhill from tower ruin and after about 30 feet head right where there are fewer trees, pass some dead branches on ground, and hopefully you'll find it! 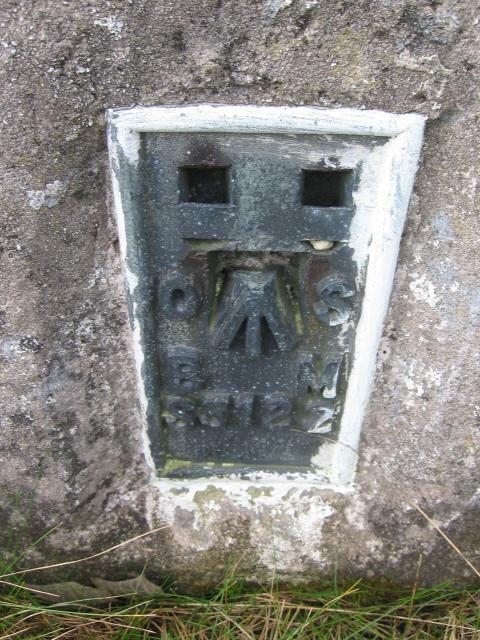 Having just visited two pillars with empty recesses on the FB side, this one contains some sort of moulding. 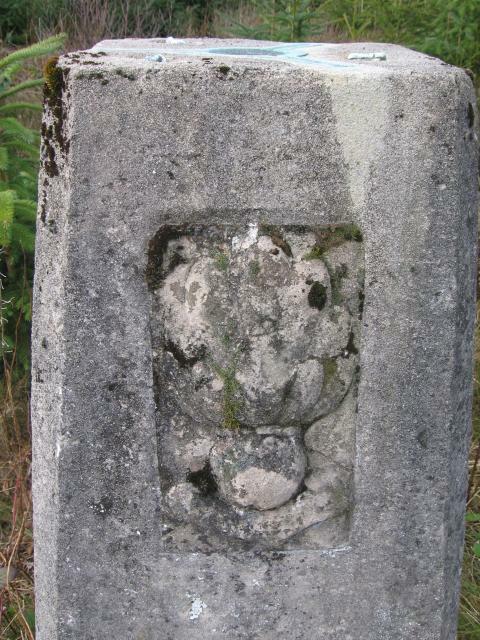 My last pillar within a 100km radius of home. My penultimate Shropshire pillar. Total now at 2669. Difficult to find in amongst the trees and gorse. Very hard to find. 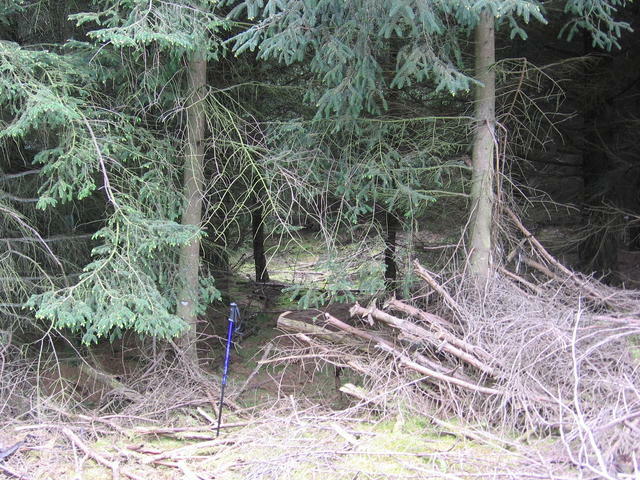 No evidence of trampled undergrowth from last logged visit 6 weeks ago. Will definitely become more difficult to find and reach as trees grow. 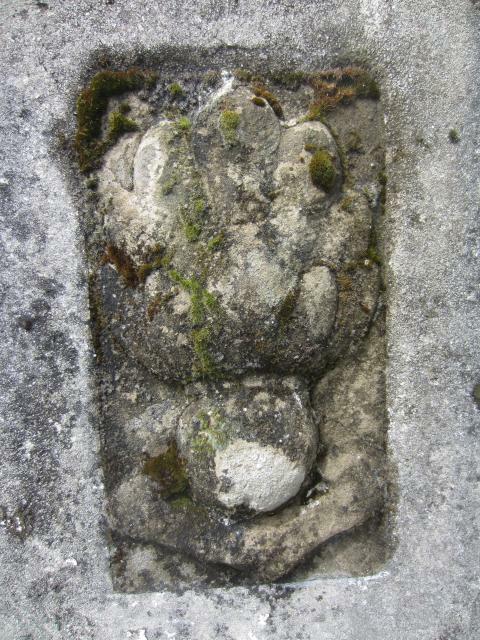 Higher score for challenge in locating and embossed crest. 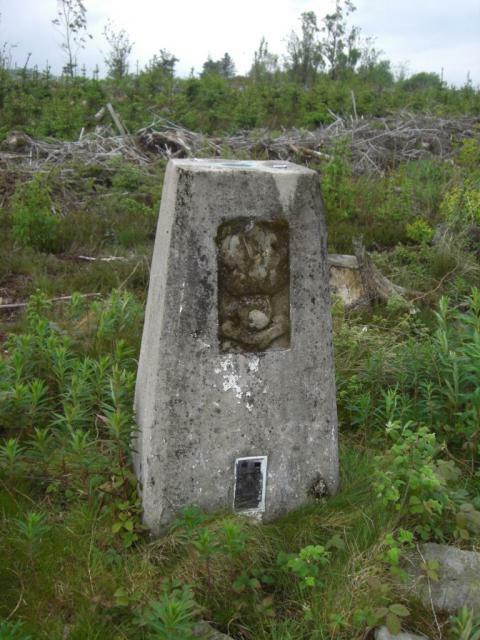 one of my more local trigs. what an absolute pain it was to find too. getting to the "tower" is a doddle. but theres been felling and replanting and any vague path has soon got covered up. its only going to get worse too as the trees grow. id advise visit soon as possible. 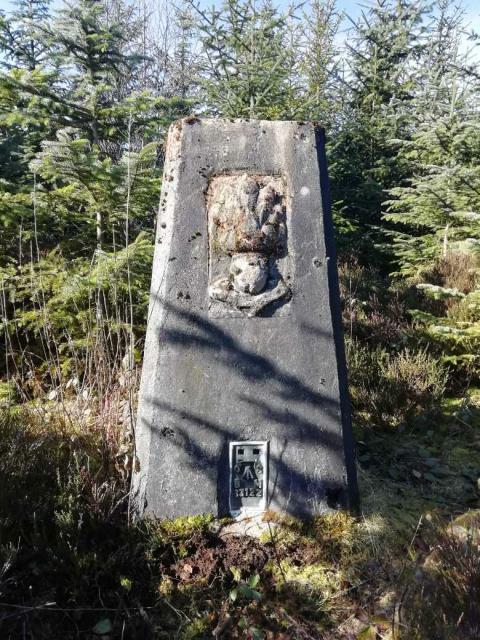 the trig is in good condition no issues there though theres no paint on it so its perfectly camoflaged. not much fun. 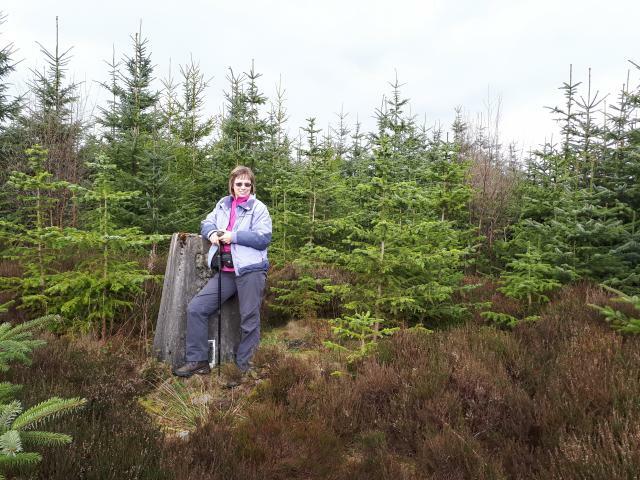 Circular walk from Craignant. Vegetation a bit thick around the pillar! Parked at the car park/picnic area in the old quarry to the N then followed Offa's Dyke Path and then the muddy path to Selattyn Tower. 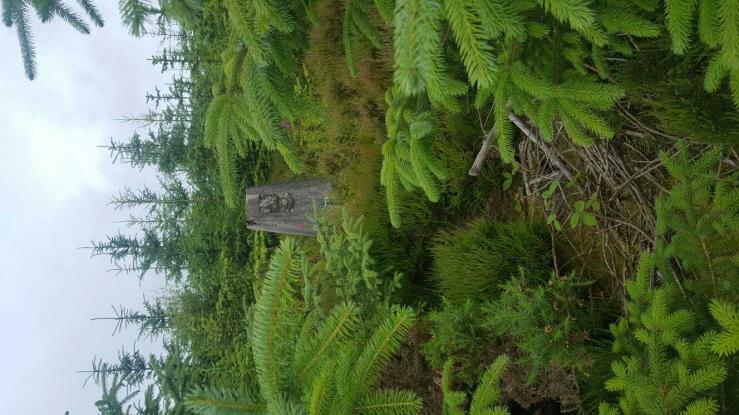 Pillar hiding amongst the brambles/heather/pines. 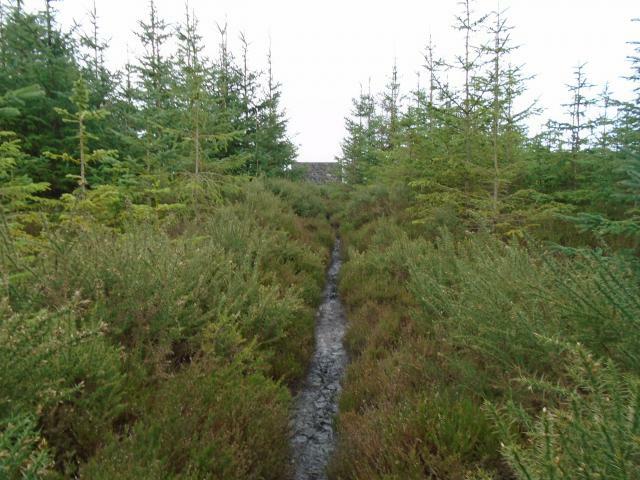 This was a pig to find lost in amongst the fir and heather. Near zero visibility in the gloom didn't help either. 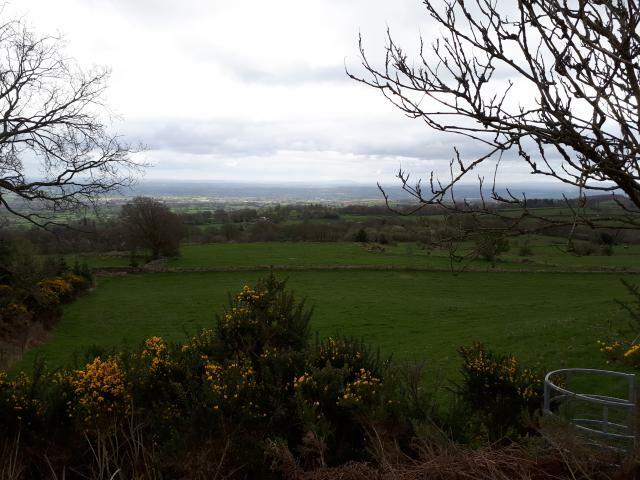 Caught bus from Chirk to Oswestry to follow Offa's Dyke Path back. 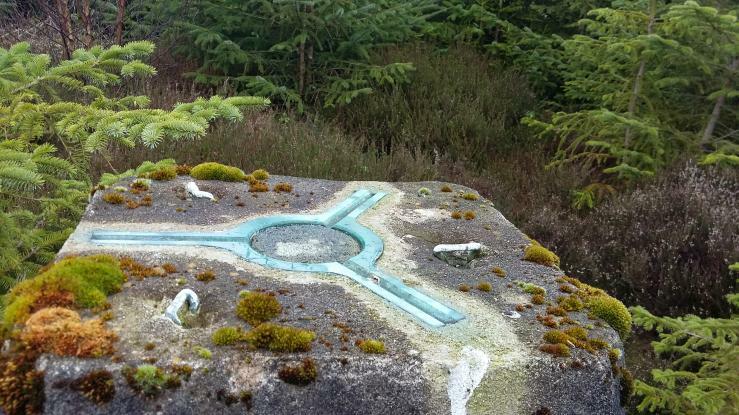 Made the diversion to visit this trig point but it took a bit of finding. Its not visible from the stone lookout on top of the hill. 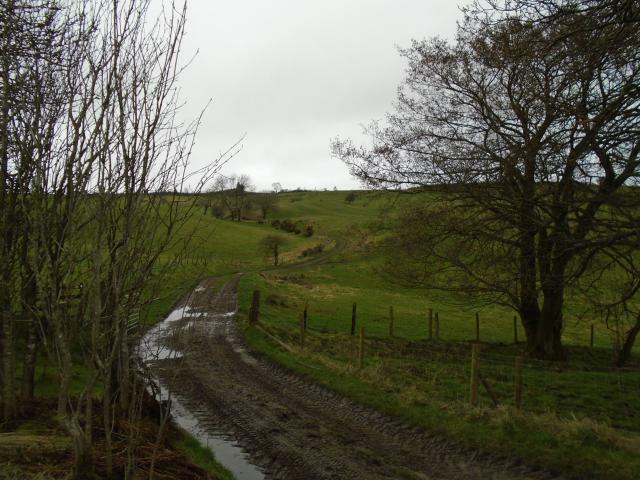 I ended up approaching this over very rough ground from the south west. 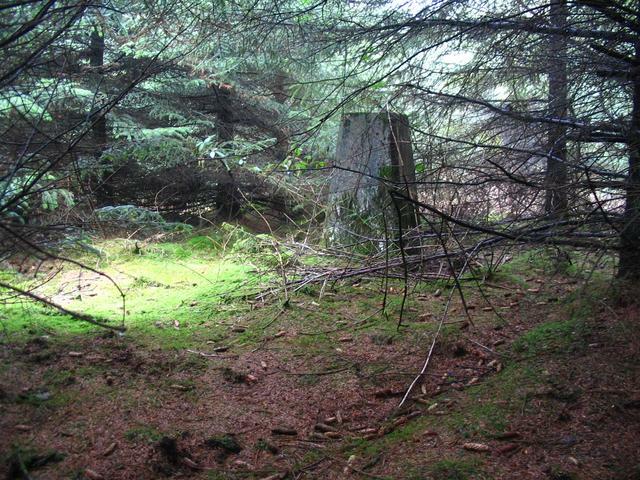 Eventually it will be completely hidden in forestry. 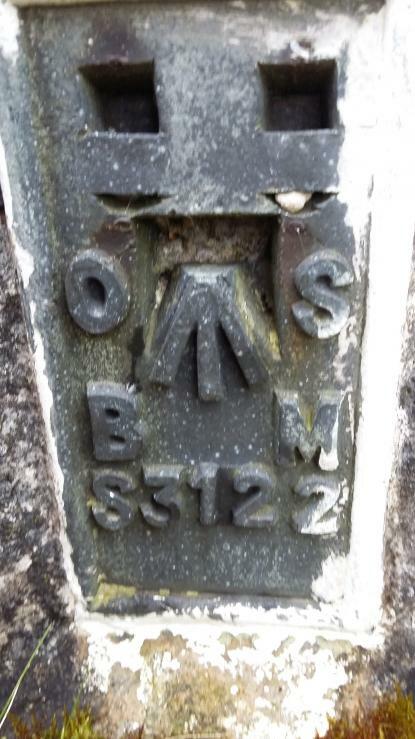 Found as YSM 179. Parked nr base of hill. TP in amongst lots of small young Christmas type trees. Standing with back to tower window the pillar is to your right in amongst young trees. Second of a trio of pillars for the day. Good views right out to the east with the odd rain shower dotted here and there over the plain. No view at all today misty ,very icy,lovely haw frost on trees.This trig will completly disappear as the new trees grow. 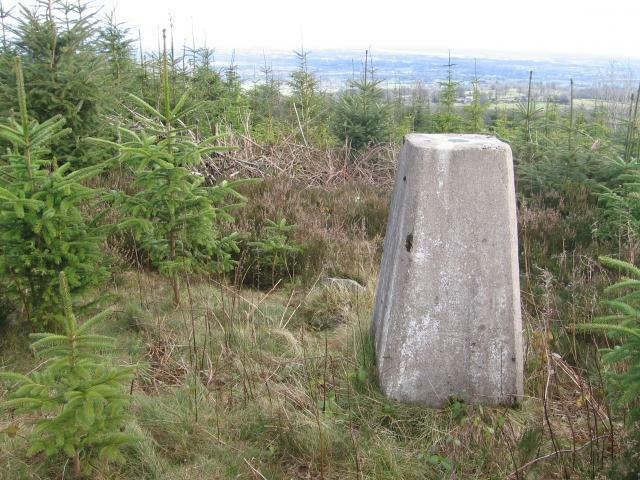 Trig not easy to find but look back from the tower and it will be found. This was no. 200 for me. Great to see it in a spot that is clear of the trees. It also looks like someone has cleaned it up quite nicely. Not far from the offa's dike. 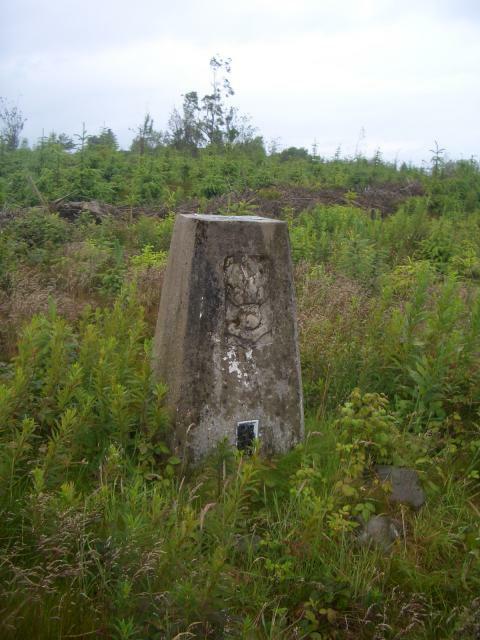 Once at the tower the trig is a short distance to the south. 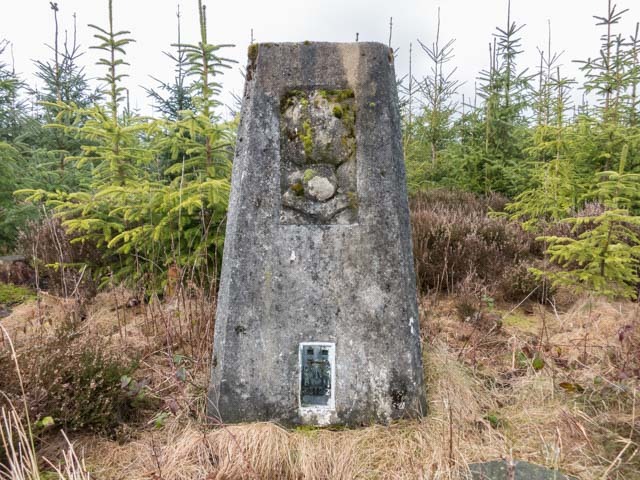 Walked in via foothpaths from car park to North.Top now deforested and pillar is visible near Selattyn Tower.Good views..
Short diversion from Offa's Dyke path. 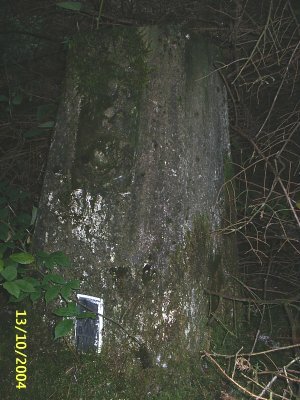 The trees have now been felled so it is easy to find the pillar - quite close to the tower. Views quite good now. 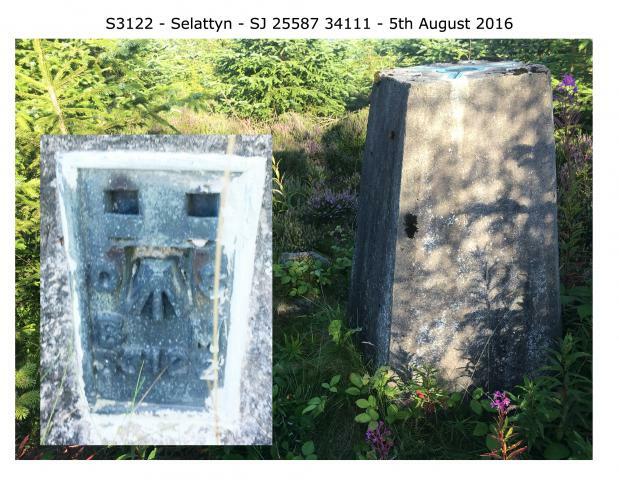 We parked at N52 54.201 W3 06.098 and followed the signed footpath to Selattyn Hill. 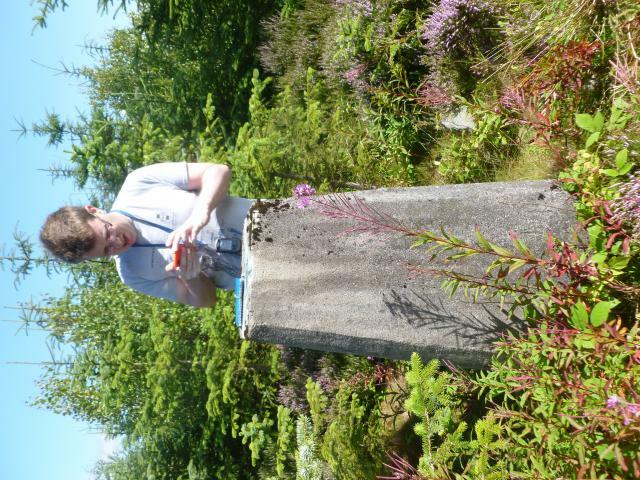 Not too hard a walk but finding the trig at the end was more difficult than finding a well hidden cache! 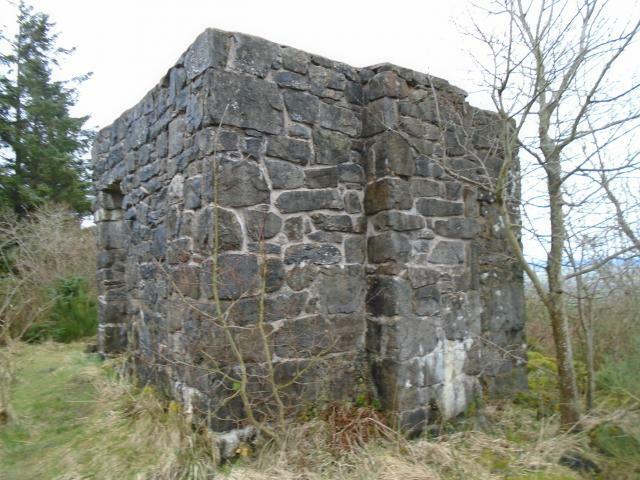 Walk from the south east corner of the folly and enter the woods quite quickly. 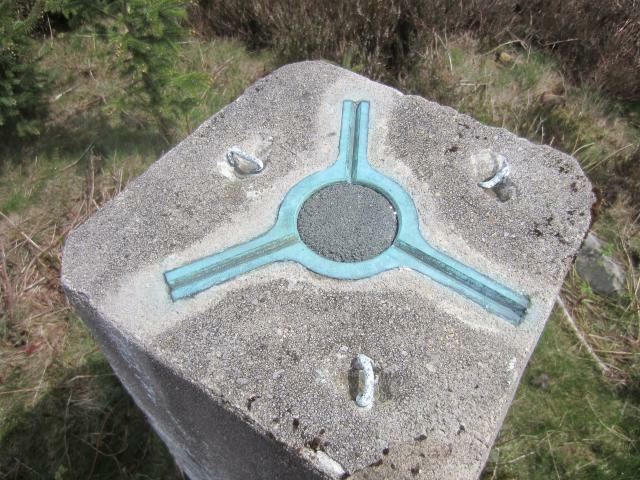 See photo for an approximate way to the trig shown by the blue walking pole. 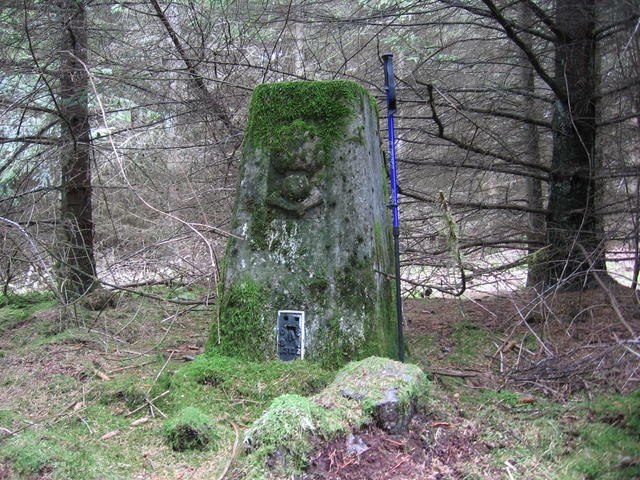 The trig itself is very green (mossy) and the coat of arms still visible. Concrete infill at the top. The only English 300m+ pillar we hadn't visited south of Yorkshire, so I was intent on finding it. We parked at the side of the road just past Brook Cottage to the south west and followed the track from there. Once you find Selattyn Tower you're not far away! Stand with your back to the chimney breast, and assuming that faces north head south east for about 50 yards into the trees. 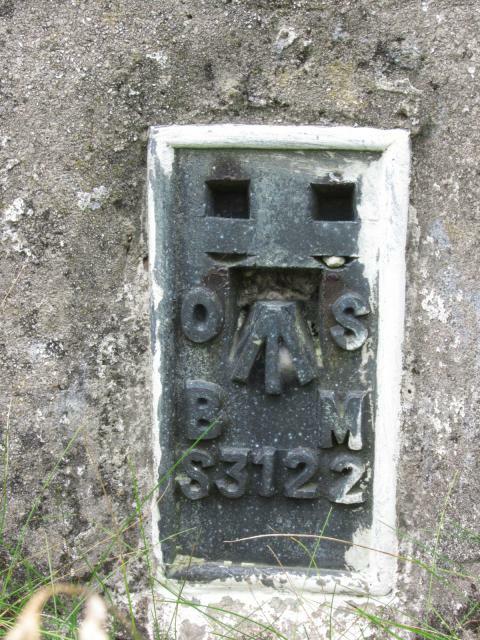 Pillar has embossed military badge above FB (Royal Artillery?). Tarmac Plug. Did this after doing the neaby cache. This was well hidden in the trees. Lots of snow around today so making the walk more interesting. 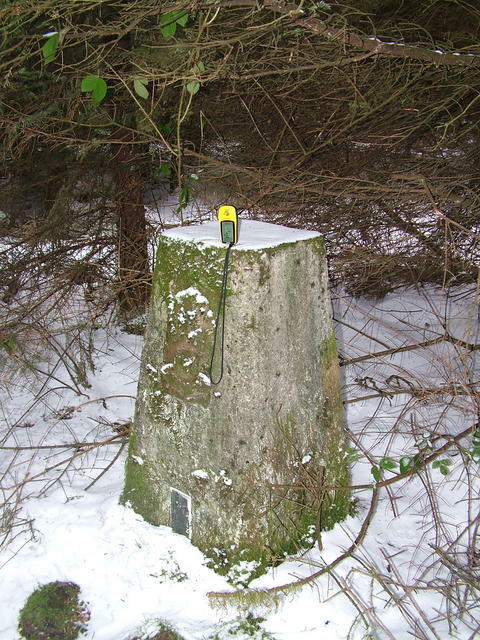 I wasn't out specifically looking for the trig point but used GPS waypoint as part of navigation during a 10 mile circular walk from Chirk. 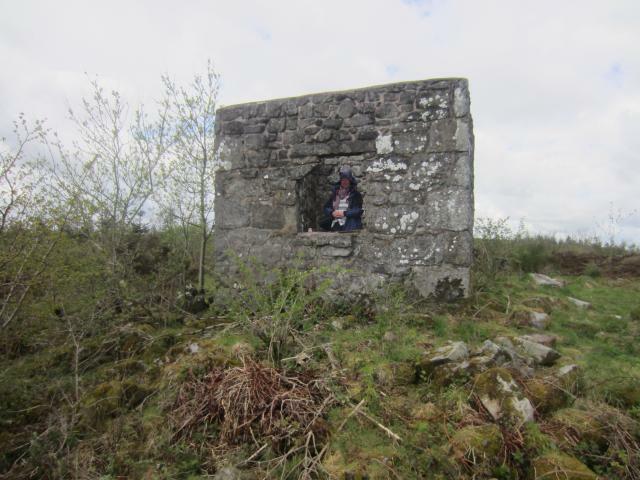 I enjoyed using my GPS and compass bearing to find it and the nearby folly. Good job we didn't rely on the footpath sign which was pointing in the wrong direction. 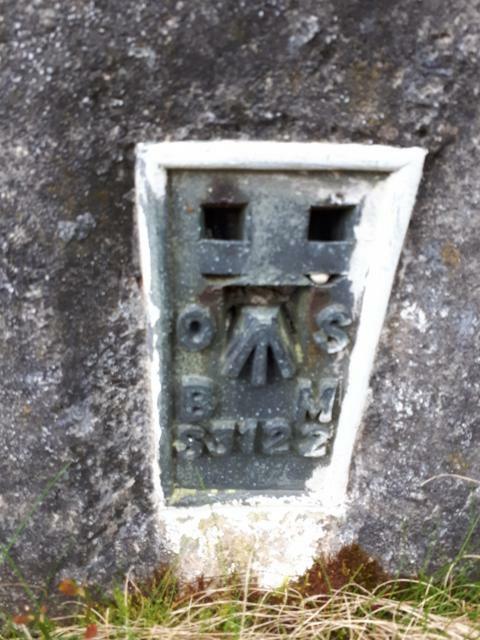 Sorry about the length of this posting but I've only just found this site and it's my first logged trig point. 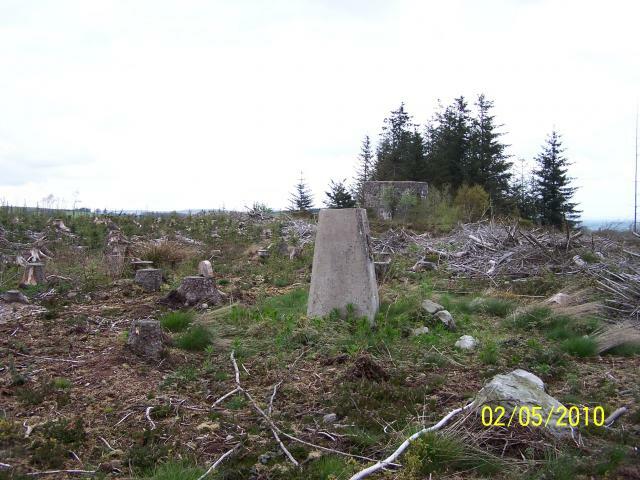 Getting to like these pillars buried in the forest ,something about the challenge i guess! 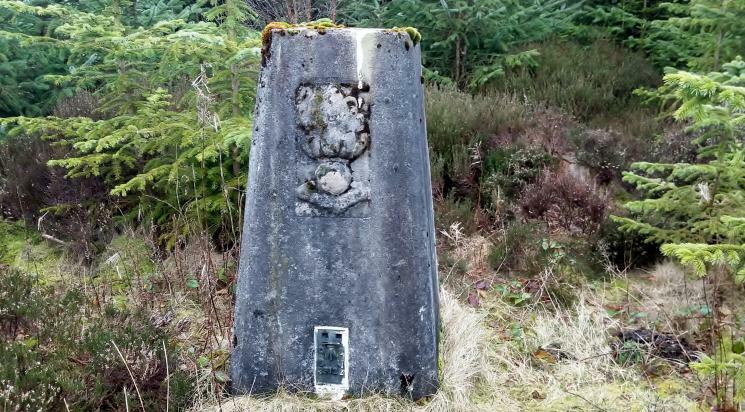 This one was a bit of a pain but there has been some recent clearing so not too difficult its located abvout 35 metres SE of the tower which stands on the footpath through the woods .Had flat GPS batteries so didnt get a fix.Pillar itself has some sort of crest embossed on a plaque above the flush . 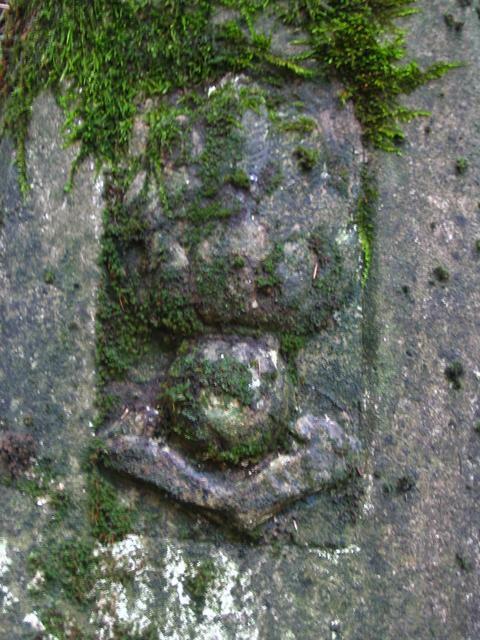 The embossed plaque above the Flush ,covered in moss not quite sure what it represents.